Engineers with the commercial spaceflight company SpaceX are working to solve a thruster problem on the firm's robotic Dragon space capsule that cropped up shortly after the spacecraft's launch toward the International Space Station today (March 1). Though SpaceX made enough progress on the thruster issue to take the step of deploying Dragon's solar arrays, the question remains whether the spacecraft can still reach the space station as planned. SpaceX's Dragon space capsule launched into orbit atop the company's Falcon 9 rocket at 10:10 a.m. ET (1510 GMT) from Cape Canaveral Air Force Station in Florida on a mission to deliver cargo for NASA to the space station. The launch appeared to go smoothly, with the unmanned capsule reaching orbit shortly thereafter. But once in orbit, the Dragon capsule's Draco thruster system did not activate as planned. The capsule is equipped with 18 of SpaceX's Draco thrusters, which use nitrogen tetroxide and monomethylhydrazine fuel to maneuver the spacecraft in orbit. "Issue with Dragon thruster pods," SpaceX founder Elon Musk wrote on Twitter. "System inhibiting three of four from initializing. About to command inhibit override." SpaceX's Falcon 9 launched the Dragon cargo capsule to the International Space Station on March 1, 2013, from Cape Canaveral, FL. "One thruster pod is running. Two are preferred to take the next step, which is to deploy the solar arrays," SpaceX officials said in a statement. "We are working to bring up the other two in order to plan the next series of burns to get to station." 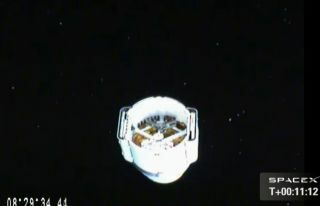 By about 11:50 a.m. EST (1650 GMT), SpaceX engineers had made enough progress to deploy the Dragon capsule's solar arrays. "Solar array deployment successful," Musk wrote in a Twitter post, after noting that "Thruster pod 3 tank pressure trending positive." NASA has a $1.6 billion contract with SpaceX to fly 12 cargo missions to the space station as part of its Commercial Resupply Services Program. This mission is the second cargo delivery flight under that contract, and is expected to deliver supplies to six astronauts living on the space station. The robotic capsule is carrying 1,200 lbs (544 kilograms) of food, scientific experiments and supplies for the station. It is due to spend about three weeks docked there, before returning to Earth to splash down in the Pacific Ocean. The flight is slated to be Dragon's third to visit the orbiting laboratory, following a test flight in May 2012 and the first supply delivery mission in October. Officials at NASA's Mission Control Center in Houston are on standby to help solve the problem. "They will be ready to do whatever is necessary to assist the SpaceX team as they work through the issue that has developed," NASA commentator Pat Ryan said on NASA TV. Officials still hope that the issue can be resolved and the Dragon can reach the space station as planned. One step toward that goal may be to rearrange the sequence of thruster burns Dragon is slated to make to arrive at the outpost. "At this point the understanding is that it's a possibility that part of the response to the issue could be a rearrangement of the planned burned sequence," Ryan said. "That would affect the rendezvous." The Dragon is currently scheduled to dock at the space station Saturday (March 2) at 3:30 a.m. ET (830 GMT). That schedule is not expected to change, NASA officials said. Follow Clara Moskowitz on Twitter @ClaraMoskowitz or SPACE.com @Spacedotcom. We're also on Facebook & Google+. This article was first published on SPACE.com.